We returned to Mount Mica in early November after a disappointing and unproductive two months spent working at the Orchard Pit. There we had hoped to find some more pocket beryl but the elements and the pegmatite were of a different mind. More than the normal rainfall kept us constantly pumping water. Many days were lost in this unproductive and seemingly never ending task. We had welcomed leaving Mount Mica and pocket MMP11-05 for a break in the sunshine, we were happy to return. We had not completely finished working the pocket, but we decided that now we would mine up strike and try to get behind it. Richard believes there is a large and yet undiscovered extension to 11-05. When our drift is heavily flooded and then pumped out, as the water level drops, a thunderous rumbling emanates from somewhere near 11-05. There is indeed a continuos drainage into 11, but since it is the lowest point in our workings it is hard to reliably determine the source of the flow. For my part, I'm not so sure. Naturally, I hope Richard is correct. I was not on hand for the first couple of weeks as our drift was extended up dip of the pocket. Part of the excitement of mining for gem is not knowing what one is going to find. It is a good thing too for if we had been aware that 6 weeks and 13 meters of nearly barren rock lay ahead of us, I am not sure we could have mustered in the enthusiasm to mine on. 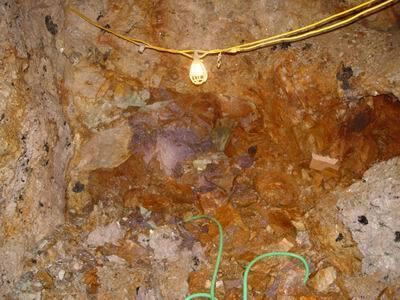 The area around pocket 11-05 was heavily mineralized in all directions. So as the drift was advanced up dip of the pocket, we were concerned and disappointed to see the mineralization give way to fine grained pegmatite and then to schist. 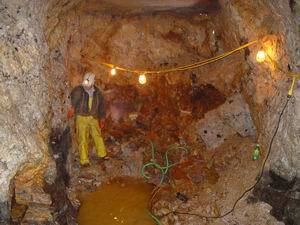 The constant fear is that we are going mine into a pinch or worst yet the end of the pegmatite. A little probing with long drill holes showed us that the schist we had encountered was a xenolith....and a big one. There was pegmatite under it and down dip, to the right, in the direction of the pocket but lots of schist ahead of us. 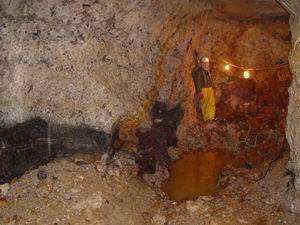 Once we had mined forward a little way it appeared then that our xenolith was a gigantic slab from the hanging wall that had peeled off and settled into the pegmatite. In the image Richard is standing in our drift after we had completed 3 advances...about 6 meters. The entrance to pocket 11-05 is on the right. The xenolith is the dark stripe directly behind Richard. The occurrence of the xenolith so close to huge pocket 11-05 was reminiscent of our experience in 2004 as we worked the pegmatite down dip and up strike of Mount Mica's other huge pocket, the Dagenais of 1979. Here too the pegmatite transitioned from exceeding well mineralized to a fine grained desert. With the Dagenais xenolith we had a good 6 meter halo of this unproductive rock to mine out. In the image to the left, the xenolith is the dark area near the center of picture. A small satellite pocket of the Dagenais can be seen at the lower left. Pocket MMP11-04 is covered by the dump truck tail gate just beyond the water. It is my guess that this xenolith too was collapsed piece of the hanging wall . As we mined to the left we encountered and abrupt thickening in the pegmatite and a near vertical steep up in the schist. The only real difference now was the xenolith we were chewing on dwarfed the one in 2004. We continued working our drift in a relatively narrow cut trying to stay to the down dip side of the xenolith and at the same time curving the advance further down dip in our effort to mine beyond and behind MMP11-05. By careful measurement we were certain of the location of the up dip end of 11-05. We were only off by 4 meters! We were indeed convinced we had worked well beyond the pocket when we mined into it in the beginning of January. In the two images above taken just after we intercepted the pocket, one can see how the xenolith was positioned fairly intimately to the pocket. At this point we had traversed nearly 9 meters of schist. 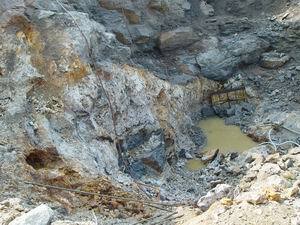 The up dip and 'small' end of pocket 11-05 can be seen as the rusty dark hole in the image above right. Notice the large mass of lepidolite just behind Richard. Heretofore a 'rule of thumb' at Mt Mica was that pocketing did not exist close to massive lepidolite. As Richard and I expanded our narrow cut to the left over the next two weeks we were to see just how large this area of massive lepidolite, spodumene crystals and pollucite really was. In fact, though we could not work it properly, once we dug it out some we could reach up under the lepidolite loosening bricks of it with our fingers. Each brick we pulled from the ice cold water that flooded our workings was coated with a fabric of opaque elbaite. The relationship here was begging the question of what had we skirted when we mined past the huge wall of lepidolite during June and July. Mining around that mass was going to be a definite agenda item. Even though we were working more than 30m inside the hill winter was making itself known. 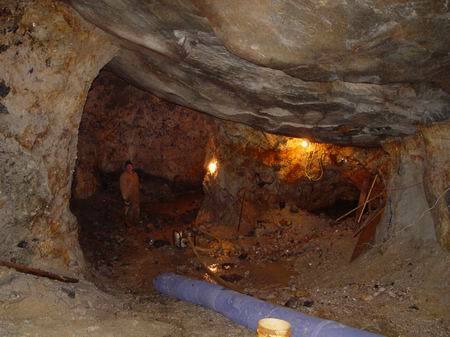 If we did not cover the entrance with a heavy tarp at night, when we returned in the morning we could see ice reached nearly the deepest parts of the mine. As the ice continued to build up at the entrance, Richard, for a time, was still able to finesse the loader out when fully loaded. Mining came to an end mid January when the ice eventually won the contest when the loader became stuck crossways at the opening. We needed chains and an excavator to dislodge it. Now we needed to wait the 8 weeks to mid March when we hope to resume the chase.